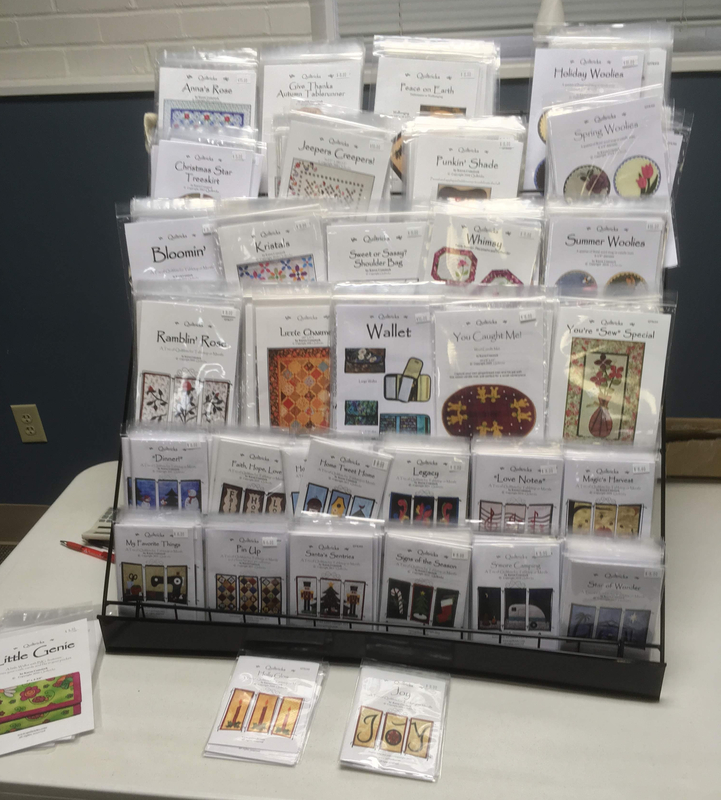 We had lots of fun at our April meeting. MJ had “hidden” plastic Easter eggs throughout the room and members and guests were encouraged to collect them. Inside each egg was a candy treat and a number for a chance to win a basket of treats. 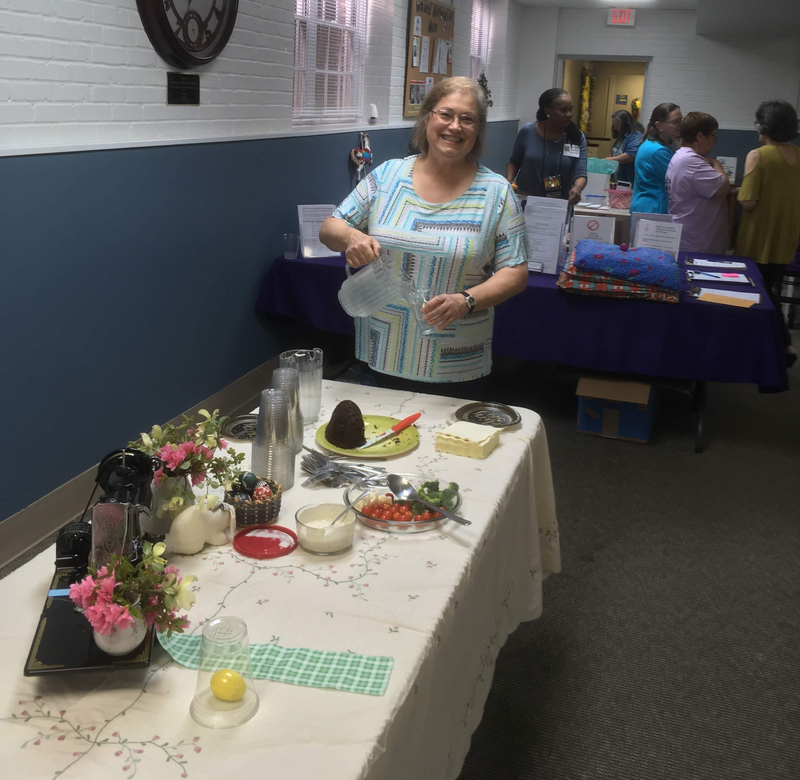 We visited with one another, enjoyed MJ’s decorations and luscious chocolate cake, checked out the information table, and welcomed guests – please be sure to give a warm welcome to new member Sandra in the coming weeks and months. 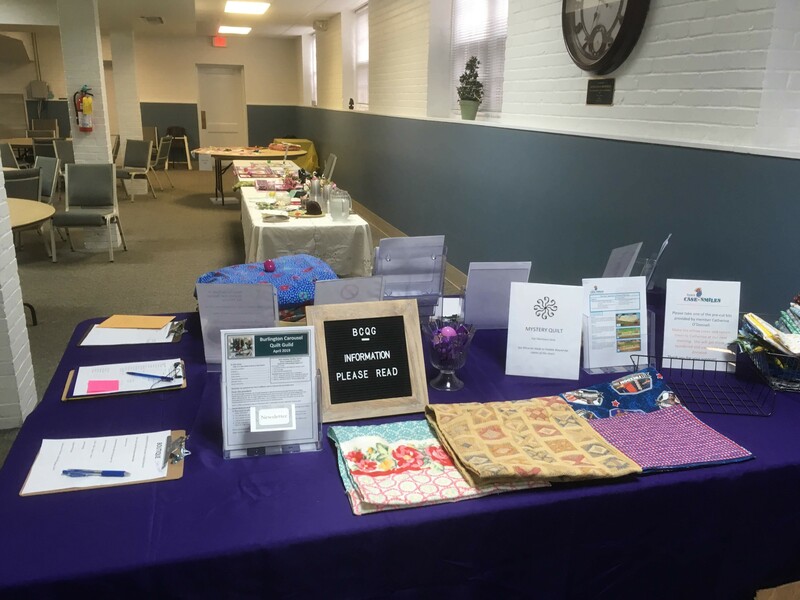 We also had a chance to check out what members have been busy doing including mystery quilt blocks, adoption quilts, and quilts donated to CrossRoads. 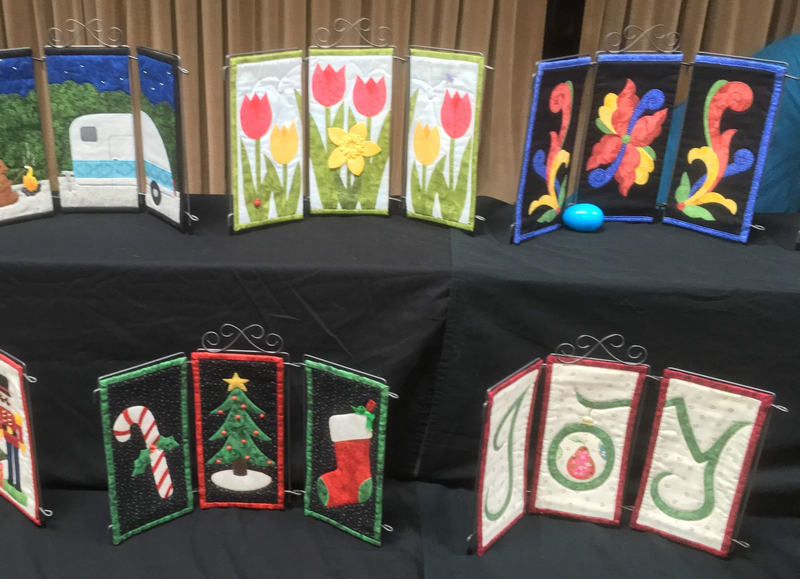 Finally we had a chance to enjoy the display of quiltlet trios and mug rugs made by our presenter, Kim Comstock as well as shop for patterns that can also be purchased from her at Quiltricks. We started the meeting by welcoming Kim Battle and two of her friends from Durham. 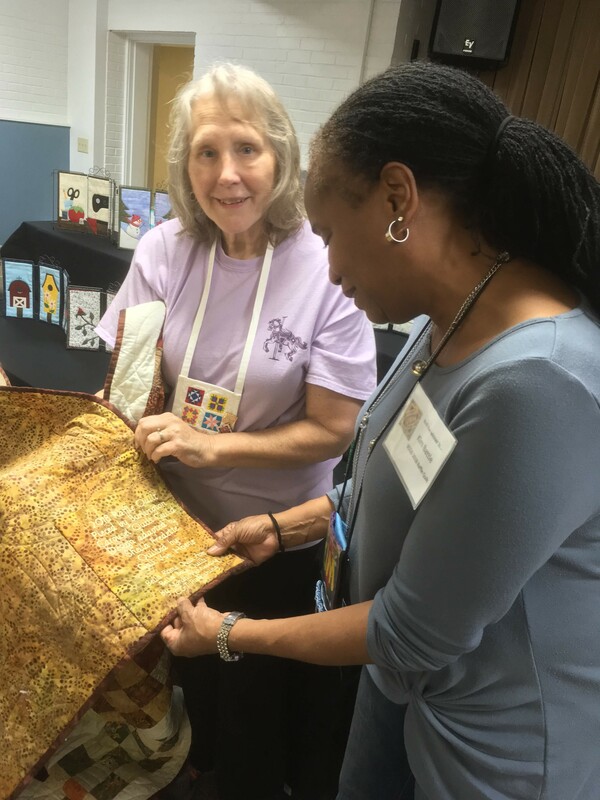 Kim, who is a member of both Durham-Orange Quilt Guild and the African American Quilt Circle, was the lucky winner of our 2018 Bella Roma raffle quilt. 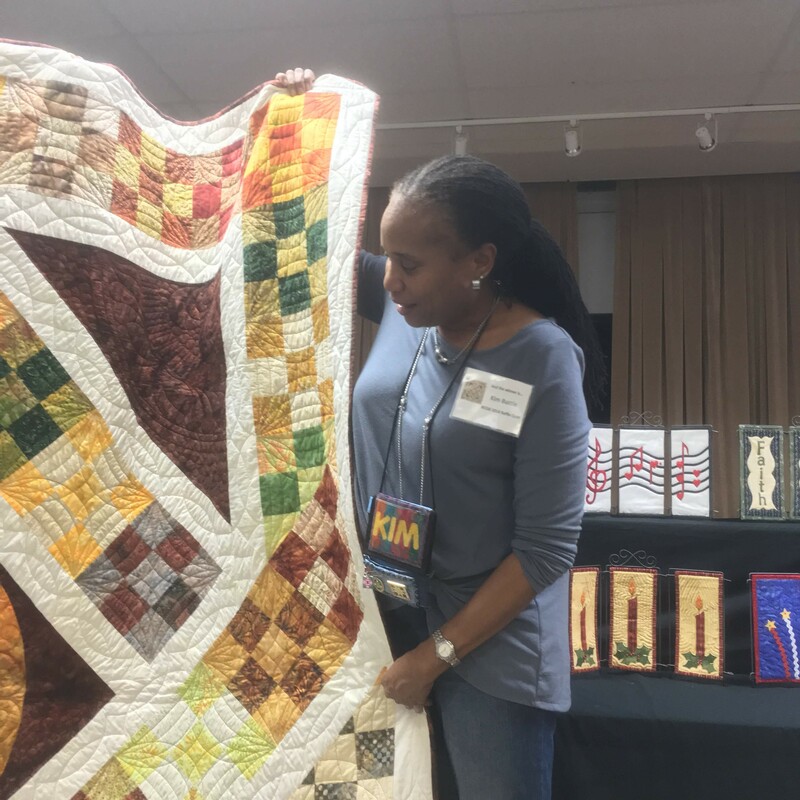 Kim’s name was drawn at Uncle Eli’s 88th annual quilting party last Thursday, and she was thrilled to receive the phone call saying she had won. 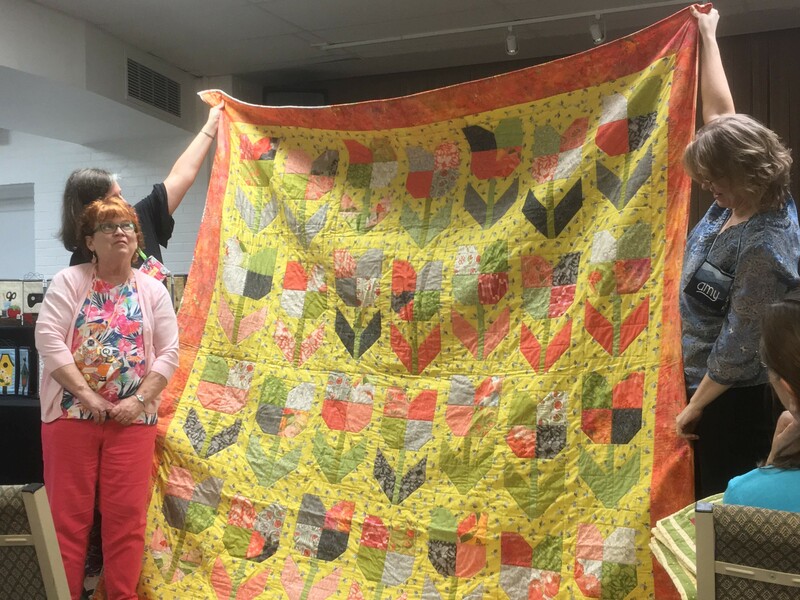 Sheila and Gail presented the quilt to Kim. 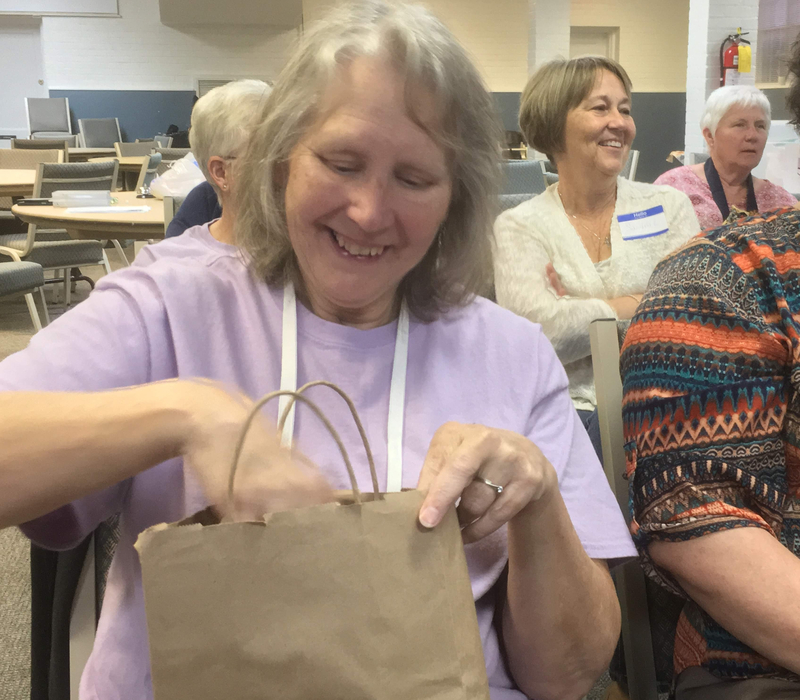 Since Kim and her guests had to head back to Durham and had eggs in their hands, MJ went ahead and drew the winning number for the basket, and Barbara was excited to win it. It was full of even MORE candy and lots of little sewing treats too. Plan – write a list of what needs to be done and what you need to get them done. Organize your space so finding things is easy. Choose the time of day when you are most productive and use it. Use small bits of time to plan, make lists, get things done. Take the first step – just get started! Put projects in plain view so they are visible. Be proud of your work and don’t stress over perfection. 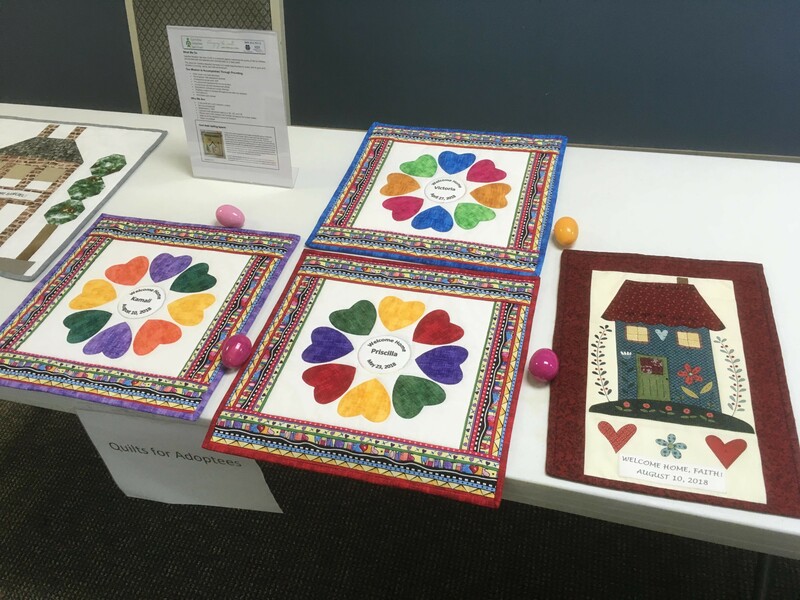 Treat yourself – sew with friends, eat chocolate, play music – whatever makes it fun and not a chore. Ask for help – not only to you get help, but those you ask feel good about themselves. Stay healthy – Exercise your hands, get up and move around. Don’t beat yourself up, and give yourself permission to donate from your stash. 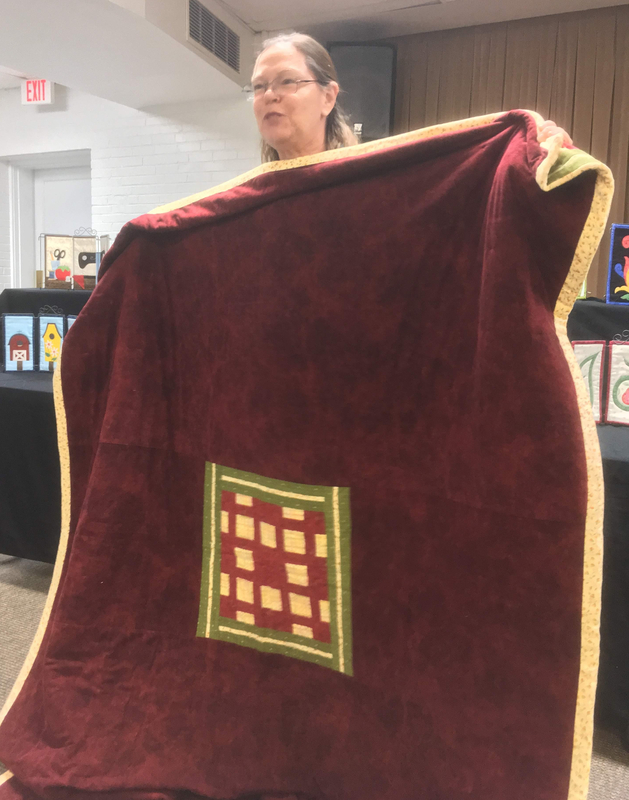 Karen then shared stories of family and friends and quilts to go with them. Sylvia and Gail won the nametag drawings – Sylvia even managed to draw her own name! 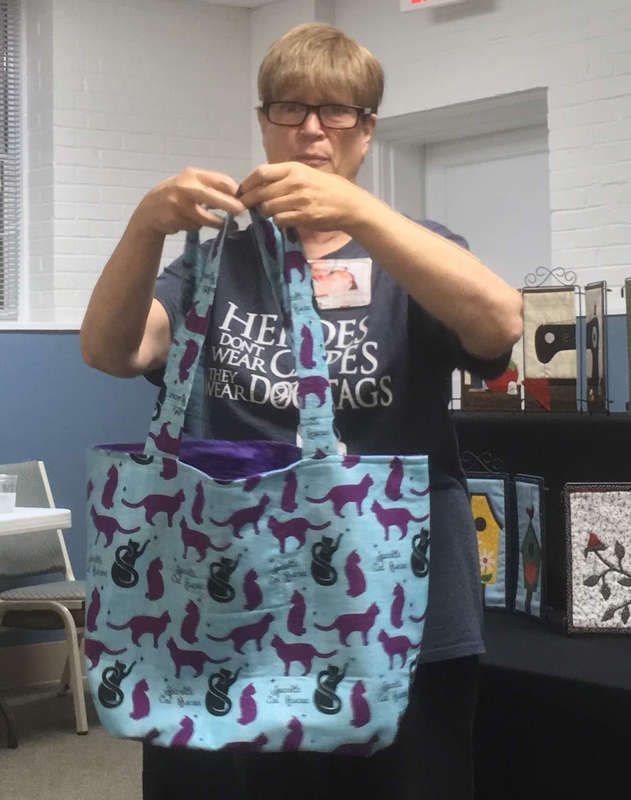 Catherine shared really cool fabric she has with the Sparkle Cat Rescue colors and logo and asked for volunteers to help make tote bags that Sparkle can either sell or give to their volunteers who foster cats. 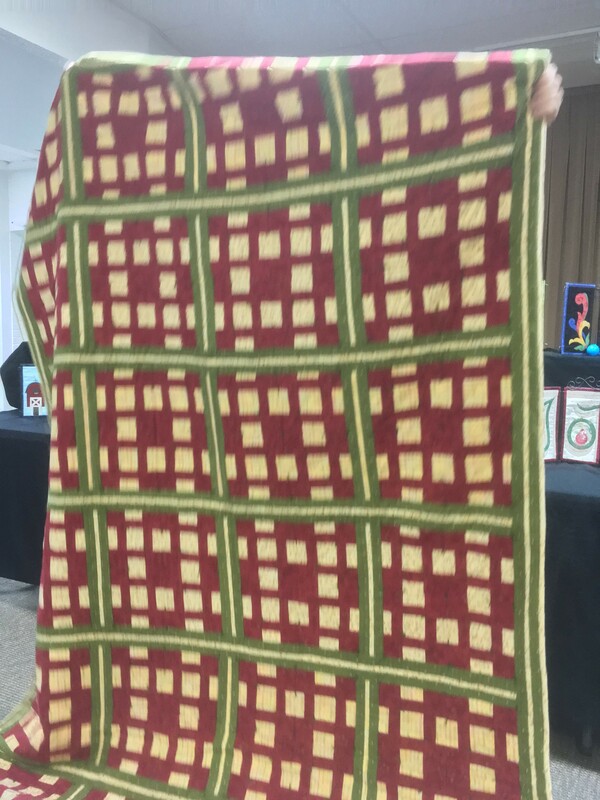 She also announced that we have made 90 pillowcases so far this year. 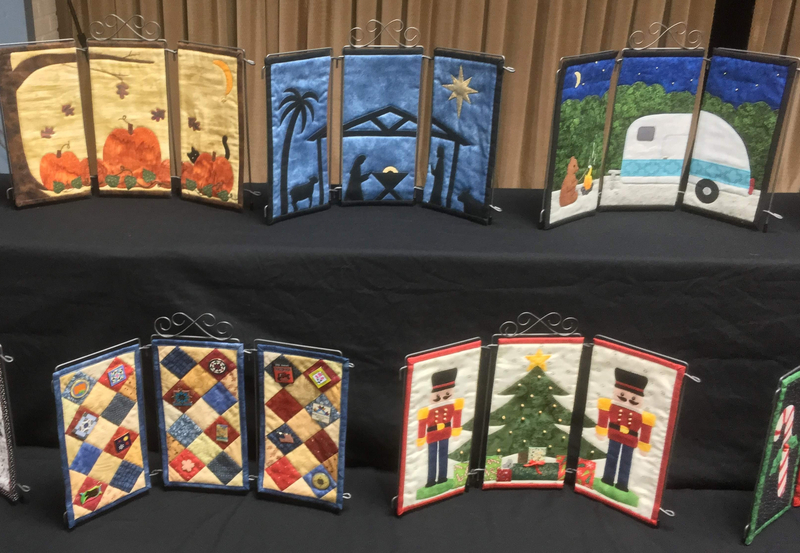 Saturday’s sew day will focus on walker bags. 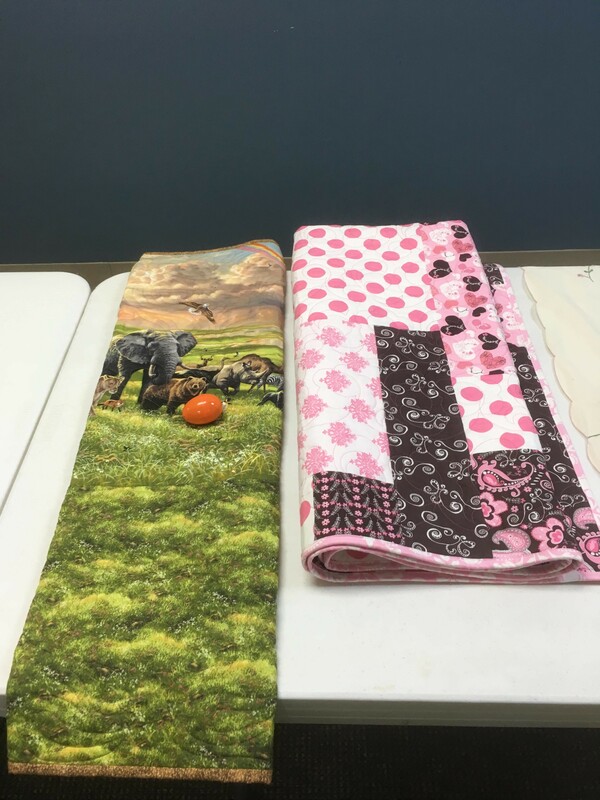 You are welcome to work on any projects you like, but we hope to kick off the walker bag initiative since this was one of the charities members voted to support this year. 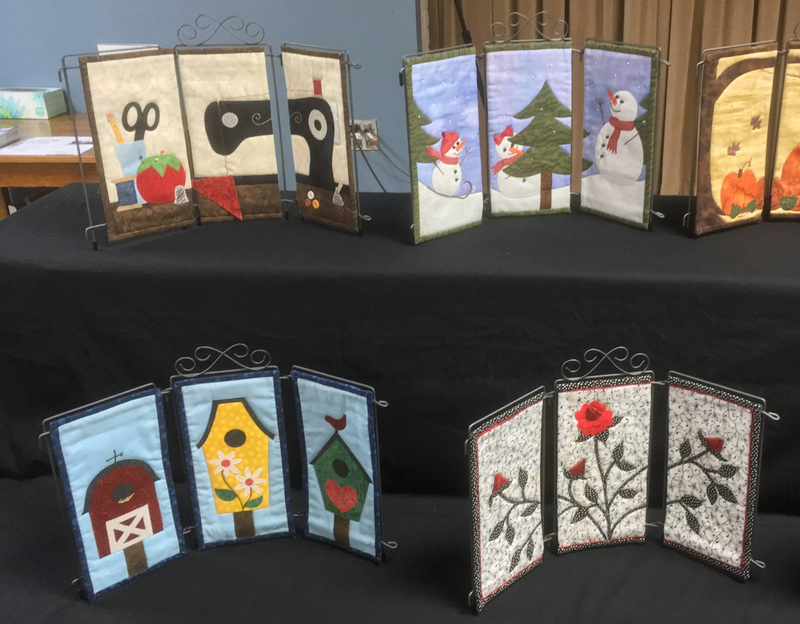 Lisa R. will be cutting up scraps for cat pillows for Sparkle, so bring any collected scraps you have for Lisa to cut and stuff. 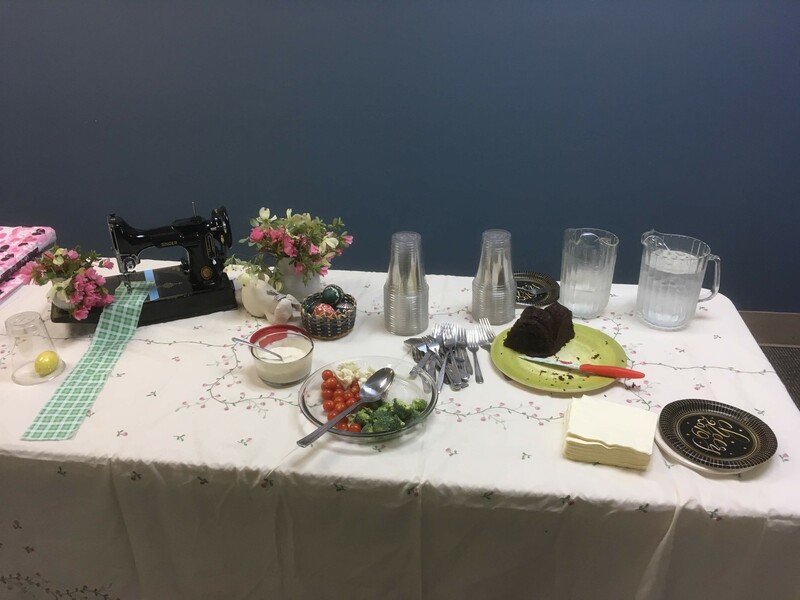 Bring a lunch, your sewing machine, and an extension cord if you have one. Come and go as needed – starting at 9am and going until 4. 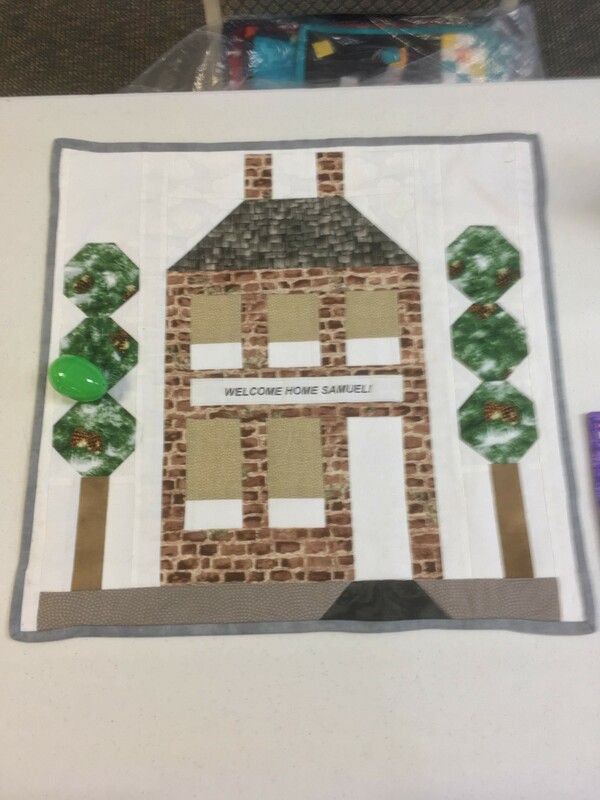 At our June 15th sew day, Penny will be sharing techniques for creating a folded star ornament (ball). 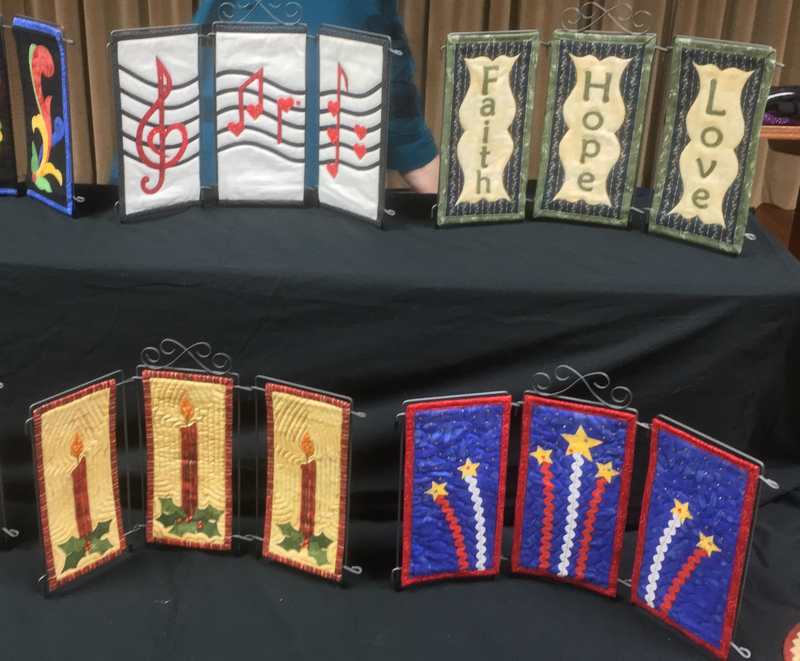 Watch for details in the next newsletter – a supply list or the option of purchasing a kit with materials. 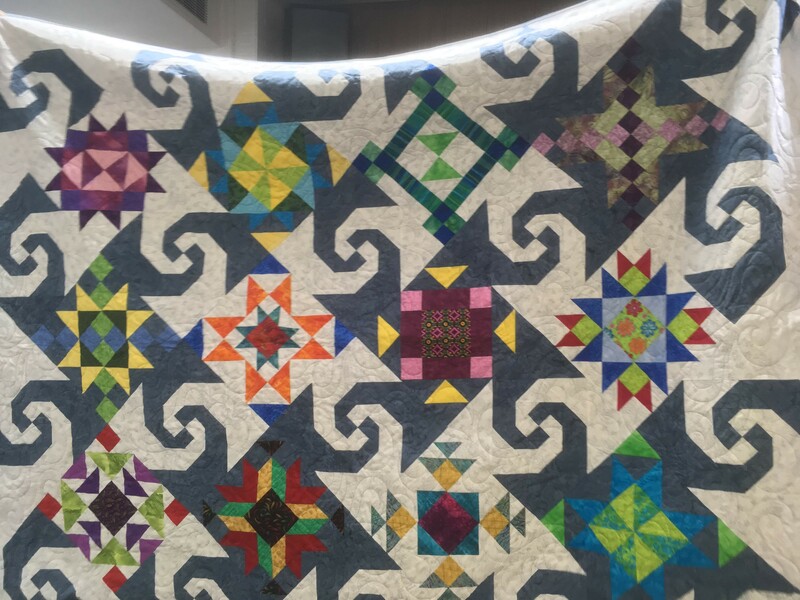 Vernett shared a baby quilt that was pieced by Frances. 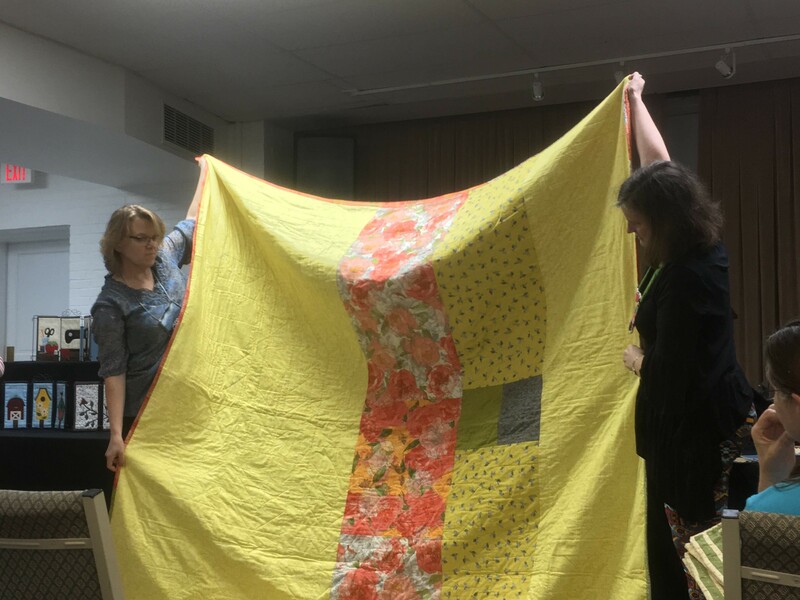 Barbara found it in France’s stash and asked Vernett to quilt it. 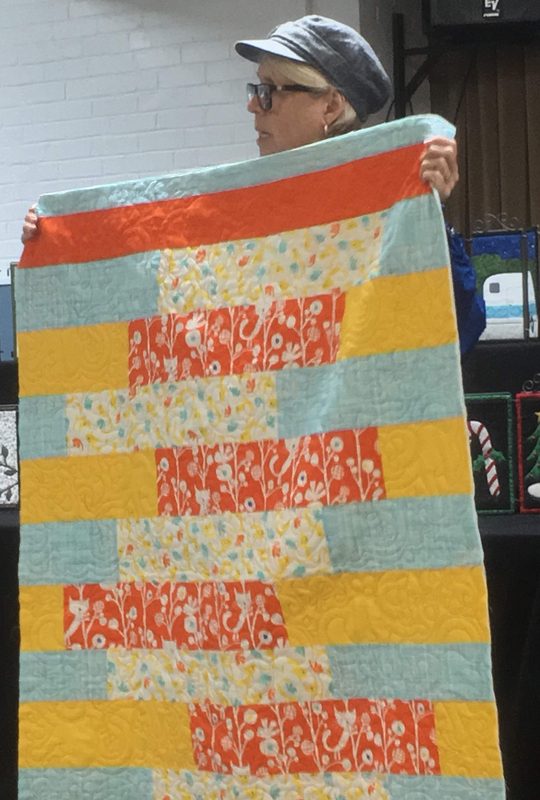 Frances loved the finished quilt. 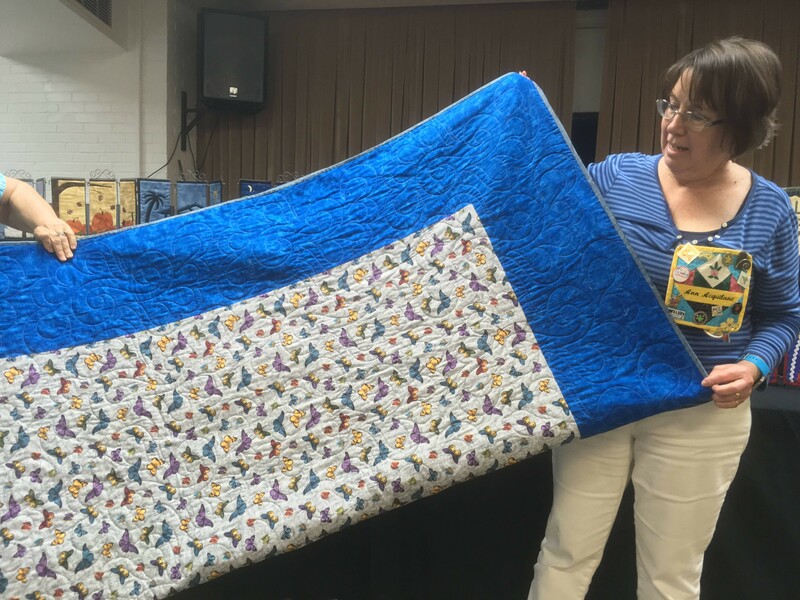 Ann found a flannel quilt in France’s stash and finished it with her new stitch-in-the-ditch foot. 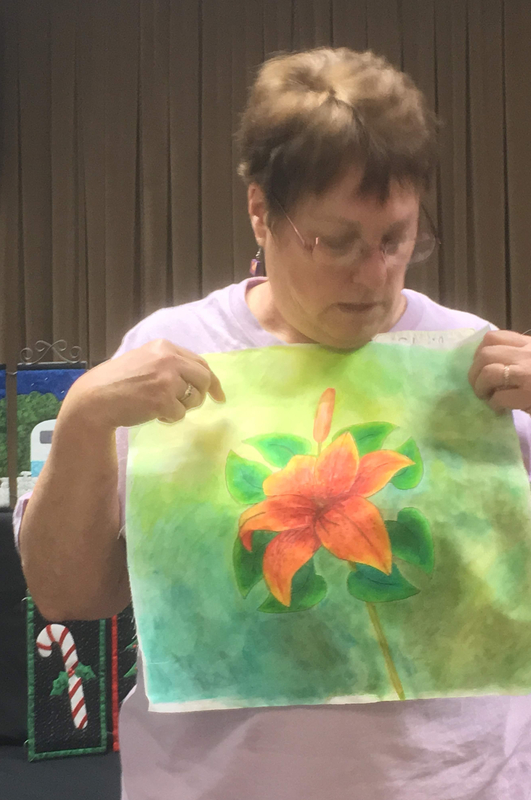 Sheila and some pals from Alamance Piecemakers have been using Inktense pencils to color pictures drawn on fabric after which they spread and blend the colors. 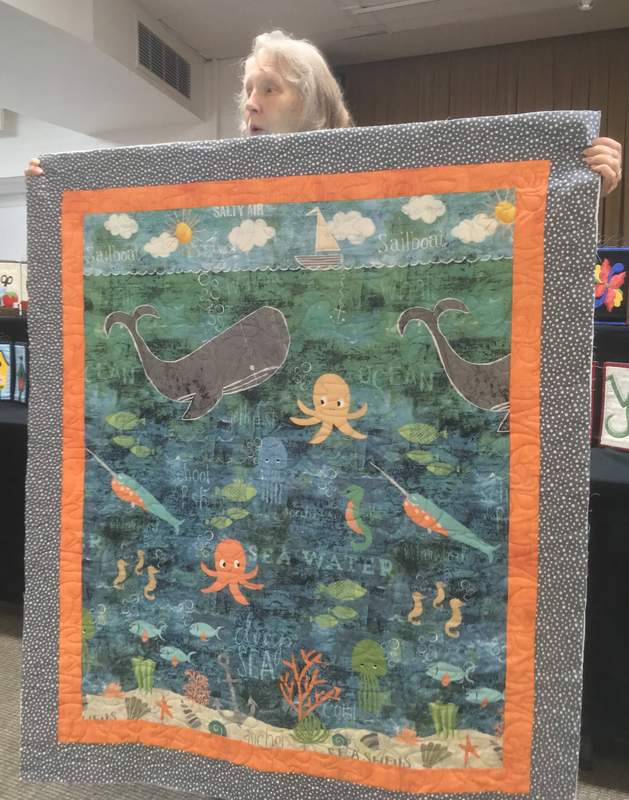 Gail shared a sea creatures quilt she is donating to the guild. 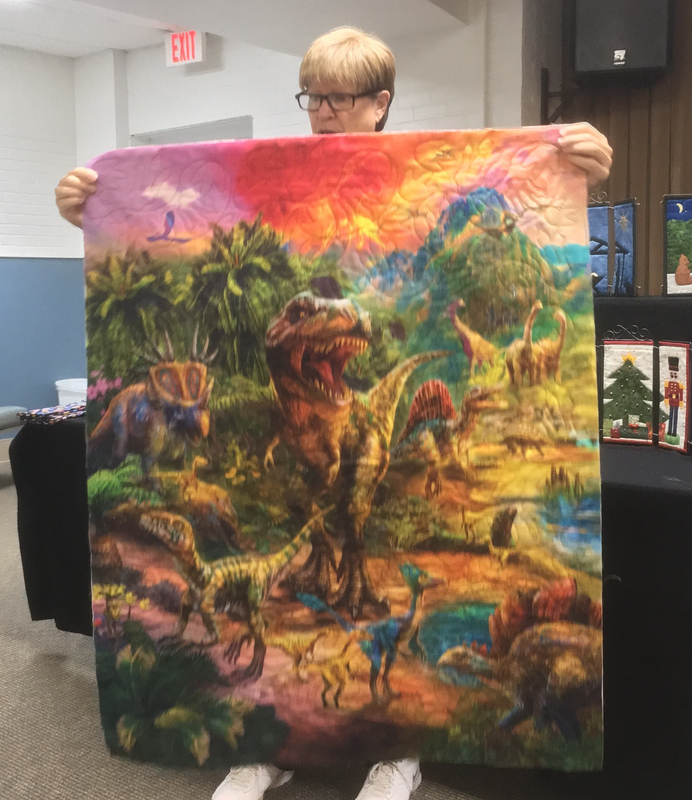 Catherine shared a dinosaur panel that Gail quilted. 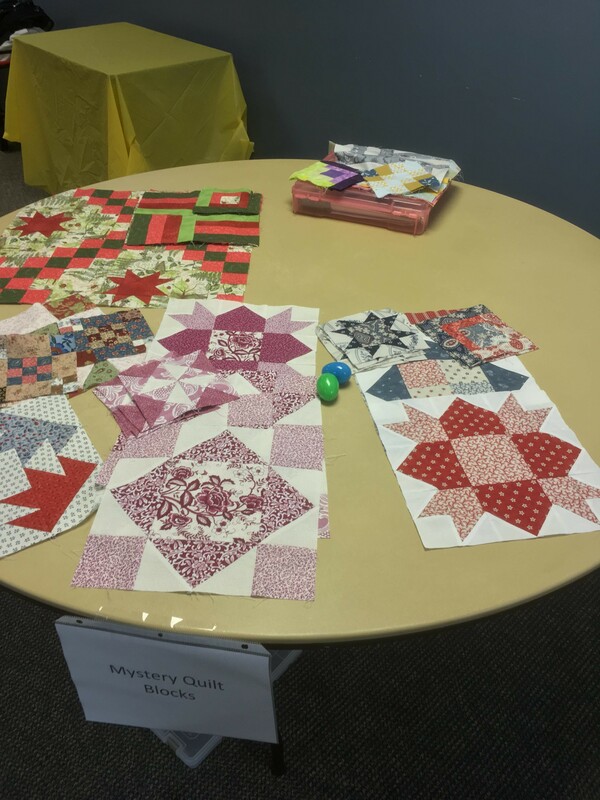 MJ tied her flannel quilt and used a leftover block to spiff up the back. 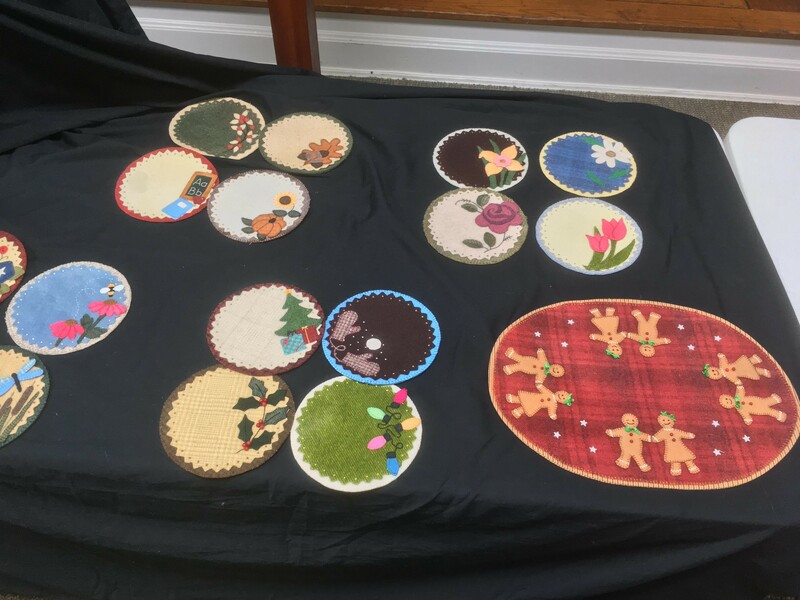 Ann finished her snail’s trail quilt, and while she STILL does not like paper piecing, she likes the butterflies on the quilt back. 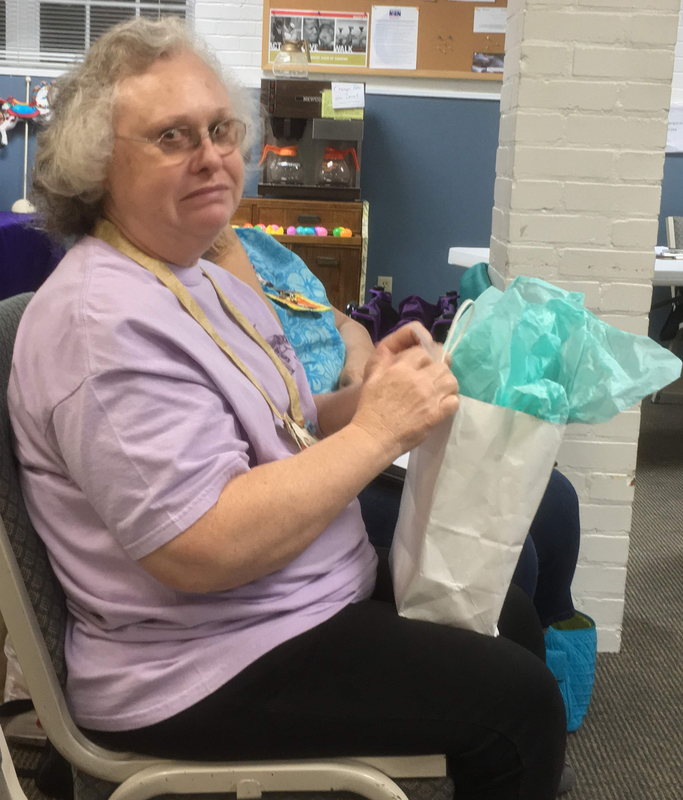 Enola was proud of the mondo bag she made with Ann’s guidance, and she shared a quilt that required a clever solution when she ran out of fabric for the backing. 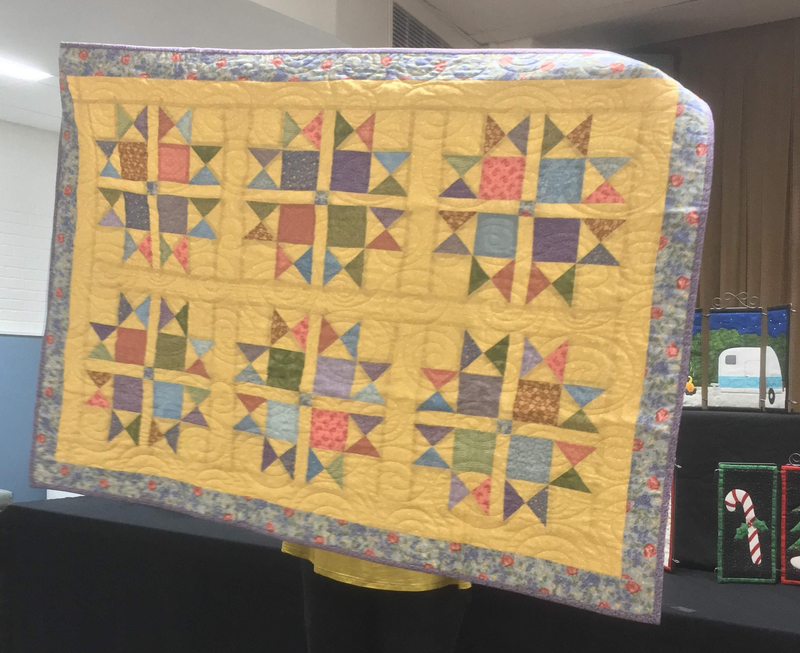 Janet shared a quilt she made from Missouri Star’s Totally Tulips pattern (she quilted it herself!) 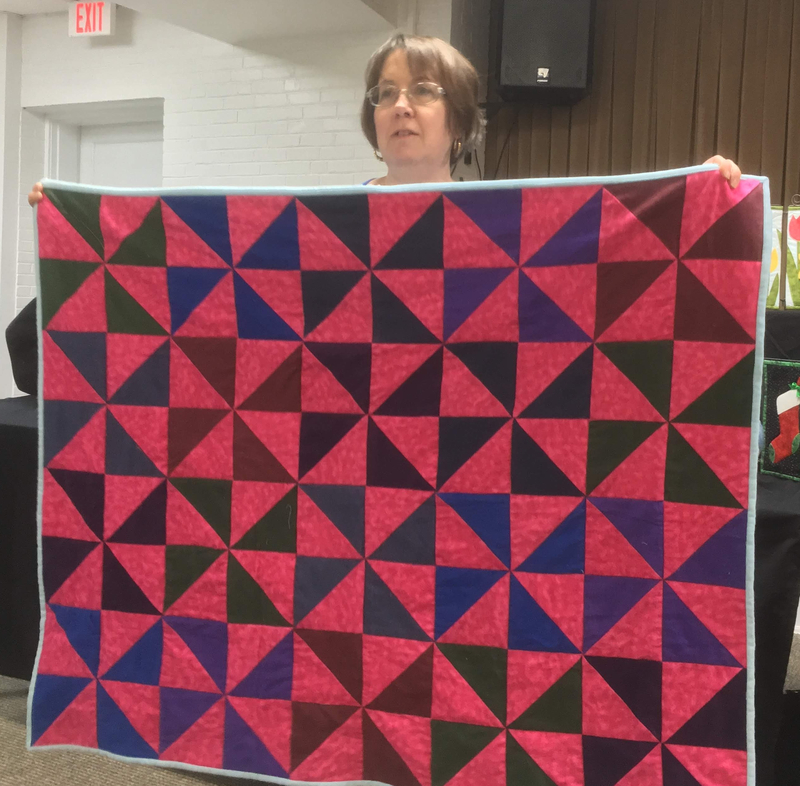 and Helen shared a quilt Gail had just finished quilting for her.